NASA’s Website connects everyday folks to the goings on of the universe (and the goings on of the American space agency that’s taxpayer-funded). The site is packed with information, and it delivers NASA’s day-to-day activities in a clean, intuitive, and visually compelling way. 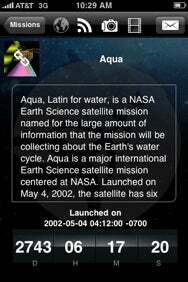 Now you can get all the information the Website offers on your iPhone or iPod touch through the free NASA app for iPhone. On a Mission: You can get a scrollbox full of information about NASA’s missions in the space agency’s iPhone app, including a running count of how long it’s been since the mission launched. The app gives you information about NASA missions, lets you view NASA images (from both NASA’s IOTD [Image of the Day] and APOD [Astronomy Picture of the Day]), gives you easy access to NASA TV videos, and lists NASA’s Twitter feeds. On the Missions screen, you can tap Filter and then tap the star icon next to any type of mission you want to be informed about: Earth, Launch Schedules, Solar System, Universe, and more. By default, only a few are chosen. Tap on Missions to get a visual, scrollable list of the various missions. Choose a mission, and you’re taken to a screen with a scrollable box of information about the mission. At the bottom, you’ll see a display of the number of days, hours, minutes, and seconds that have passed since the mission was launched. Tap on the camera icon from within a particular mission, and images from that mission are displayed. Likewise, tap on the filmstrip icon to get a list of videos about the respective mission. 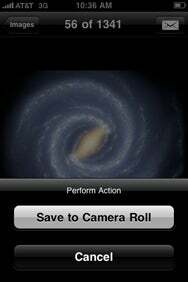 Shot from Space: After viewing NASA images in the iPhone app, you have the option of saving them to your Camera Roll. On the Updates screen, you can tap Filter and choose from a variety of feeds you’d like highlighted in your app: JPL’s Asteroid Watch, CassiniSaturn, NASA (which features news from NASA), SOFIAtelescope, and more. The app lets you e-mail images, mission information, and videos to anyone you want. The e-mail contains all the information you see in the app, with a link to NASA’s Web page about the same mission, image, or video you passed along. So the next time you want to see your taxpayer dollars at work, give the NASA app a go, and co-explore new frontiers with NASA’s astronomers.